The Bali Dog Halfway House was created in March 2015 by solo rescuers and it has gone from strength-to-strength, working collaboratively to create a safe house for many rescued Heritage Bali Dogs. We need to raise AU$12,000 for our rent due in June 2017. This will keep our house, project and most importantly, our dogs, safe for another 2 years. WALL OF FAME as one of the HALFWAY HOUSE HEROES! * NOTE: We will email you with in 60 days of purchase to collect your details and send you a digital photo of your plaque once it is installed. ​on our wall of fame and know you have helped us help more homeless animals. But it is only thanks TO YOU, our supporters, who believed in the solo rescuers making a difference in animal rescue in Bali! "To create a safe house to support individual animal rescuers to house their rescued street dogs to heal and rehabilitate until adoption". To continue this program we need to raise AU$12,000 by May 2017 to pay another 2 years up-front rent. Fundraiser closes June 31 2017. Plaques will go into production July 2017 for completion and hanging August 2017. GET YOUR NAME ON OUR WALL OF FAME! 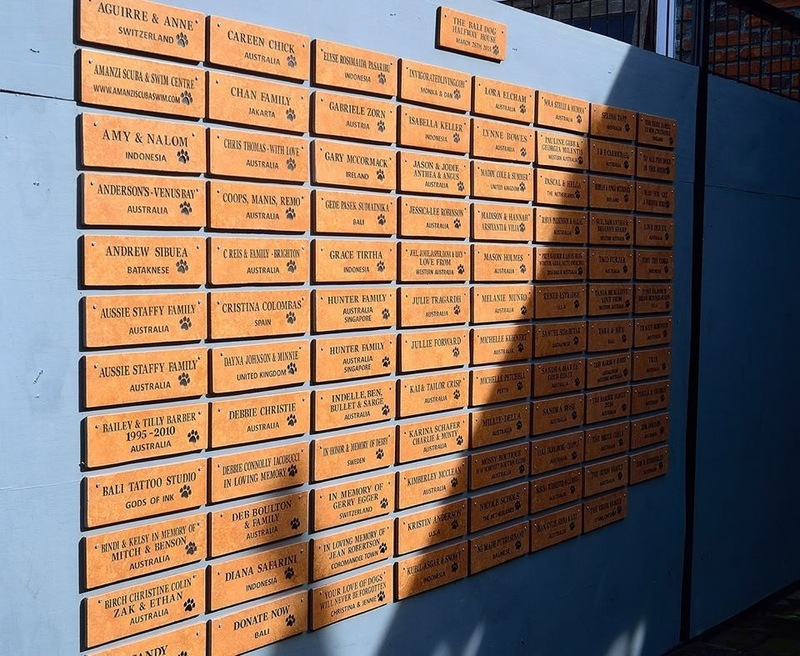 Have your name will be fur-ever etched and commemorated at The Bali Dog Halfway House and displayed at the entrance on our WALL OF FAME. • We will send you a digital photo of your plaque once it is installed. Get the whole family involved in Saving Bali Dogs and you will be fur-ever commemorated and displayed on our WALL OF FAME. Community support is a great way for business' to give back when they can! Have your Business Name and URL fur-ever commemorated at The Bali Dog Halfway House and displayed on our WALL OF FAME. WANT TO HELP RAISE MUCH NEEDED FUNDS FOR THE BALI DOGS? BECOME A HALFWAY HOUSE HERO. CONTRIBUTE TO OUR PROJECT TODAY! © The Bali Dog Halfway House. Designed and created by We Create Pty Ltd. All rights reserved.